The parish was the head of the union of the parishes of Kilfinane, Particles and Ardpatrick. The modern day parish of Kilfinane was formed in 1861 when Ardpatrick became a separate parish. In Begley's "History of the Diocese of Limerick" Ballingaddy was named as part of the parish of Kilfinane. However, today it forms part of the parish of Kilmallock. Kilfinane is translated as Cill Fhionáin, which means the church of St Fionáin. St Fionáin founded his church here in around the 7th century but no one knows where the site of this church is now. It is believed that St Fionáin was Fionáin of Dromhoura, whose feastday is on February 13th or December 8th. The local market was held on Tuesdays and fairs were held on May 19th, August 9th and October 25th. Kilfinane is home to the noteworthy moat of Kilfinane. The moat measures 34 feet high and 54 feet in diameter at the base and 20 feet at the top. The view from the top of the moat gives a good view of the surrounding countryside. Opinions differ as to whether the moat was used as living quarters or as a ceremonial mound for the crowning of Kings. It may have been used as a guarding post for the Fermoym, which in former times was a place of great importance. Kilfinane was one of the royal seats of the Kings of Cashel. 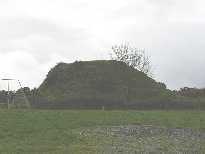 It is claimed that Brian Boru repaired and strengthened the great fort of Kilfinane. A small group of Palatines came to the area around the 1760s. The local landlord of the area Charles Silver Oliver brought these settlers, who had originally come to Ireland from Germany, here. The Palatines helped the locals defeat an attack from the Defenders in 1793. The founder of the Methodist Church, John Wesley visited Kilfinane on six occasions during his ministry between 1765 and 1789. Wesley preached in the Market House to the local Palatines in Ballyriggan. He was dismayed on his first visit to the Palatines when he discovered that their lives had descended into "drunkenness, cursing and swearing". Wesley converted the Palatines to Methodism. In 1897 Kilfinane won the All Ireland Senior Hurling Championship for Limerick. In those days, the county champions represented the county in the All Ireland Championship.